Please contact me if you are interested. This life size replica comes with a certificate of authenticity. I believe it is 1/500 in the world in production. PM me or write here. Do you have any pictures? Or any real information you can provide? Yes I have photos, but was unable to locate them on this drive. I should be able to find them soon. Do you how I can post them here? It is over 6 ft. tall and is an actual life size replica. Just as many of the Star Wars figures are sold, on a platform, life size, weapons included...exactly like from the movie. What other specific "real" information can I provide you with? I think it's over 6' tall with the base and everything else. The Replica is in storage, so I apologize for not having accurate measurments. There are so few of these in production, I could nt find any info on the net. Anyhow, the Replica is approx. $5000, but Im still researching the market. C3PO is $11000 on email right now, A Don Post dealeo. If you are interested we can get more technical. *Sigh* I lack the funds. Can you wear it?? The armor and flight-suit, I mean? 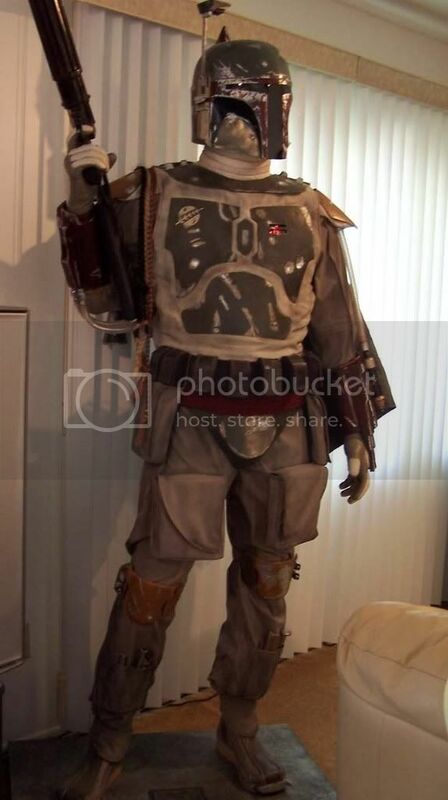 No you cannot wear the suit it is afixed to the Replica Body. It is awesome. Hopefully someone with a large wallet and a keen eye for the REAL DEAL...will be interested. Feel free to spread the word. This is 100% legit and ships anywhere in the world. I would love to have that. Good luck finding someone with 5,000 dollars available to spend on something like that. If I ahd it, I'd spend it I am bad with money hat way; I can never hold onto it. I'm pretty much in the same boat as everyone else. Lacking funds. But still drooling. Wow...That's all I can say. Wow. Glow ..... emailed you from my yahoo acct. couldnt PM you here.??? That's definately a Don Post there... I'm interested. Email me: SharpyProductions@gmail.com with the details and shipping. Boba has found his new home and his bounty! ooooo......... It must be so nice to have that kind of money. I like how Han is posed kind of similar to how he was propped up in Jabba's palace. Pretty nice touch.